A whistle-blower warned the government of alleged failings in child protection in Haringey six months before Baby P died, it has emerged. Former social worker Nevres Kemal sent a letter about her concerns to the Department of Health in February 2007. It was passed to the Department for Children, Schools and Families, which said proper procedures were followed. 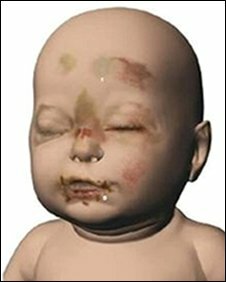 Baby P, 17 months, died in August 2007 following abuse. His mother and two men were convicted of causing his death. Lawyer Lawrence Davies told BBC Radio 4's Today programme his client's letter expressed worry that children in the borough were "at risk". This was despite an inquiry into the killing of eight-year-old Victoria Climbie - she died from abuse and neglect in the same borough eight years ago. Ms Kemal believed recommendations made by Lord Laming following that inquiry were still not being followed. The Department for Children, Schools and Families (DCSF) confirmed it received a letter dated 16 February 2007 that arose from an employment tribunal and contained "an allegation that child protection procedures were not being followed in Haringey". The letter was sent to the then health secretary, Patricia Hewitt. It was then forwarded on to the DCSF. She told the BBC that correct procedures were followed. A DCSF spokeswoman said the department's reply on 21 March "made the point that ministers could not comment on the specific details of the employment tribunal case". "Secondly, as is standard practice, [officials] suggested that the individual should notify the relevant inspectorate, the Commission for Social Care Inspection, to take appropriate action and they provided the necessary contact details. "The permanent secretary of the DCSF has looked at the reply and is confident that the proper procedures were followed," added the spokeswoman. Mr Davies said: "If the social care inspectorate had acted on it or the ministers had acted on it, it seems hard to believe that the situation in which Baby P was seen 60 times in total... presumably several times after February, couldn't have been averted." The social worker, who no longer works for Haringey Council, cannot discuss the issue as the local authority has taken out an injunction preventing her from doing so. Mr Davies said his client was "pushed from pillar to post" before finally being advised to tell the inspectorate. "By that time we had an injunction against us so we couldn't go back to the inspectorate. The inspectorate had been properly advised at the time and had done nothing." Mr Davies said he was in the process of appealing against the ban. He said his client was effectively calling for a public inquiry and that her letter stated the "situation seemed to be out of control". Baby P died in August last year after suffering 50 injuries including a broken back, fractured ribs and extensive bruising. Four separate inquiries have been ordered into the death, which happened despite the child being on the "at risk" register and receiving more than 60 visits from health and social work professionals and police over eight months. On Thursday, Haringey Council's cabinet member for children, Liz Santry, said of Baby P: "We are truly sorry that we did not do more to protect him". An official inquiry into the Victoria Climbie case by Lord Laming made a raft of recommendations for child protection procedures - ministers have asked him to check on their implementation across England. The other inquiries are being led by the government, Haringey Council and the General Social Care Council. There have also been calls from MPs for an independent public inquiry. No-one at Haringey Council has lost their job over the case. The council welcomed the government review, saying it would be "open and co-operative" with inspectors and would implement the findings "swiftly and comprehensively". The minister for London, Tony McNulty, said government departments would be looking again at the contents of the letter. Michael Gove, shadow secretary of state for children, schools and families, said the public deserved a government explanation about what had happened. After a nine-week trial at the Old Bailey, Jason Owen, 36, from Bromley, and a 32-year-old man were convicted of "causing or allowing the death of a child or vulnerable person". The boy's mother had already pleaded guilty to the same charge, and all three will be sentenced on 15 December. The mother and her 32-year-old boyfriend also cannot be named.